Are you looking for amazing view of Halong Bay? Let's come to Bai Tho Mountain. Located adjacent Halong Bay, Bai Tho Mountain seen from afar looks like an enormous castle with three undulating towers on solid walls. Going to the mountains is to comfortably admire the majestic Halong Bay and soak up the intimate and peaceful nature. How Bai Tho Mountain is Unique? Located In Halong city centre and right from the bayside. Bai Tho is the name of the mountain with the height of 200m above the sea level. The former of the mountain call Truyen Dang. But in 1468, King Le Thanh Tong carved a poem on a cliff. A poem mean Bai Tho in Vietnamese. 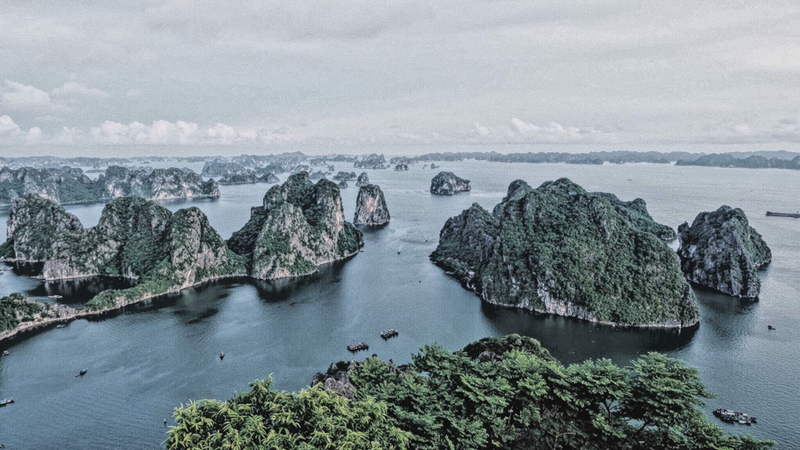 Thanks to the mountain side overlooking the bay, the mountain is considered the most ideal viewing place in Halong. Because of the path up to Bai Tho Mountain flickering in the alley of the households on Hang Noi Street, Bach Dang Ward. It isn't easy to conquer this mountain. The path isn't too long, but quite steep. However thanks to the system of solid stone measures. Two side aisles are hundreds of plants that have grown from the limestone cliffs. What to see from Bai Tho Mountain? When tourists participate in Halong travel to Bai Tho in the summer or autumn, the atmosphere here's still trendy. Along with the melancholy birds as in a royal garden, tourists may also easily capture the goats grazing on the slopes, or the monkey perching on a tree branches. After about half a hour of climbing, tourists are going to able to set foot on Bai Tho Mountain. There is a poetry carved stone stela and flagstaff at the top of the mountain. Whoever used to hasn't visited Halong Bay are definitely also stunned from the poetic scenery and magnificent beauty outside front. 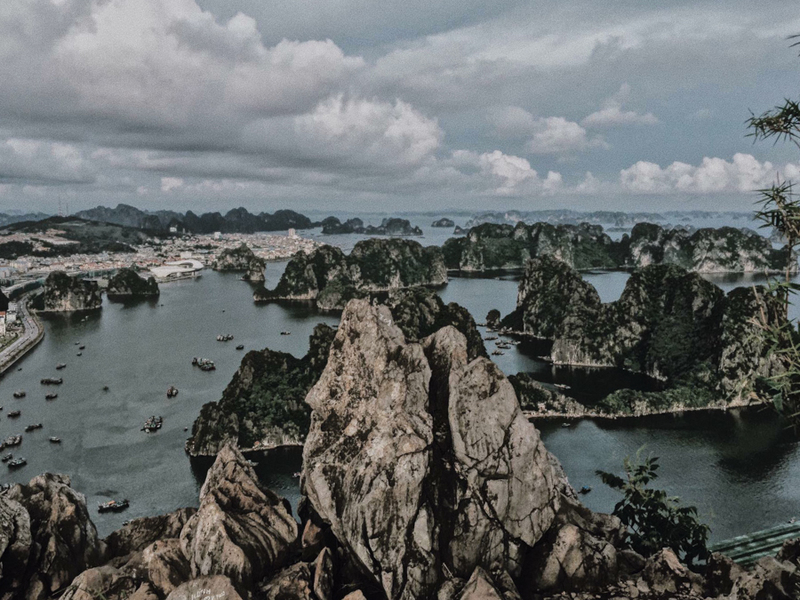 Apparently only standing on a mountain, tourists simply know why the Bay is named Halong. Far from the mountain down the Bay, there's a group of dragons with numerous large and small rocky islands wandering along the surface of the bay. This appears to be a brand new viewing angle, even citizens of the coastal city. Standing on top of Bai Tho Mountain, tourists have a possibility to admire the new appearance of Halong city. From everyday Hustling and bustling Bai Chay tourist zone. The Vietnam's longest cable stayed bridge crossing Cua Luc River into the downtown with high rise buildings, mines where exploiting black gold of the nation, all exudes strong vitality of a young city. 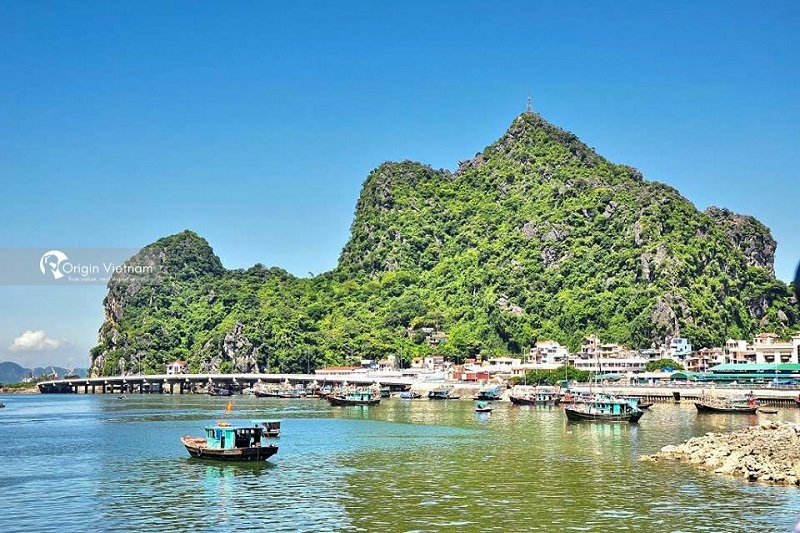 Coming to Bai Tho Mountain, tourists may comfortably explore Halong within a 1 km radius from the foot of the mountain. The first stop in the travel is the Long Tien Pagoda, the most well-known pagoda in the city. Located among the crowded streets with over 70 years old with the legs leaning from Bai Tho Mountain, Long Tien Pagoda has remained her inalienable majestic and serene view. Together with supplying incense to pray to the Buddha, tourists to the pagoda is to visit, go to the sights and revel in the airy and relaxing area under dreaming mountain shadow. Not far from Long Tien Pagoda is the coast road linking Bai Tho Bridge 1 and Bai Tho 2 for fresh traffic. Tourists coming here may take a stroll or leisurely bicycle ride around the foot of the mountain, and feel the breeze of the sea blowing from the wasters. Stopping at one of the streets sellers or enjoying fresh sea food dishes is among interesting things to do in Halong generally And Bai Tho Mountain particularly. Particularly, Within a radius of 1 km, Halong market is an attraction for tourist in Halong tourists shouldn't ignore. As the largest commercial center in Halong with deserve things from memorabilia, fashion, or electronics. Outdoor sea food market attracts the most both domestic and foreign tourists. Tourists can buy crap, shrimp, fishes... With the most reasonable prices and easily enjoy them right on the travel Halong. Additionally, Snack stores, boutiques along Le Thanh Tong Street throughout Bai Tho Mountain. It's also be home to meet tourists have tastes and their shopping. Delicious dished and magnificent natural landscapes actually leaves a deep impression to the tourists in the mind. Bai Tho Mountain is among the most impressive attractions for tourist in Halong tourism. 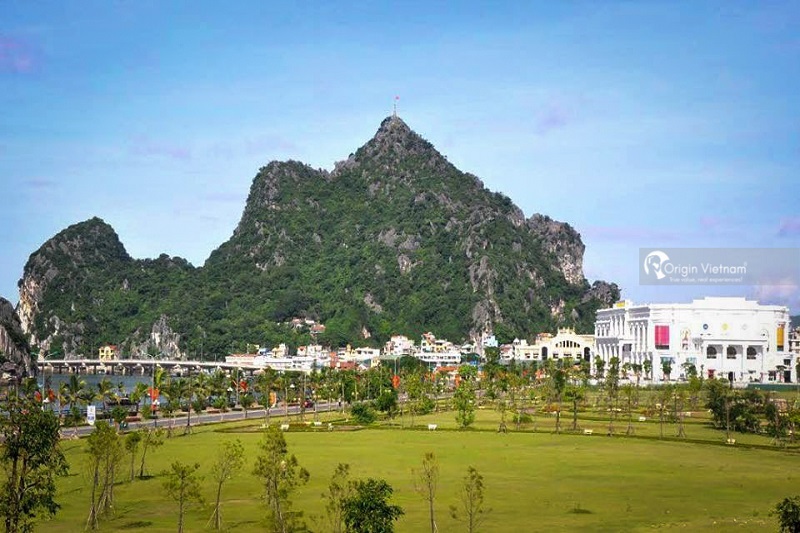 This beautiful mountain is worthy a must see a tourist place at almost all tours in Halong bay, attracting both domestic and internartional tourists. With the information above we hope it's useful for you. Should you have any further request please feel free to contact Origin Vietnam! Wishing you have a wonderful time holiday Vietnam in Halong City.